Target, which for the record, is one of my all-time fave places to shop, has a checkered past – and present – in social media. The reason: they, or someone who is advising them, still believe in message control. Alas, dear Target, message control is, and always has been, an illusion. Target clearly didn’t get social media in 2007 when they asked students to lie to their Facebook friends, and they’ve run afoul of MoveOn.org today over campaign contributions. 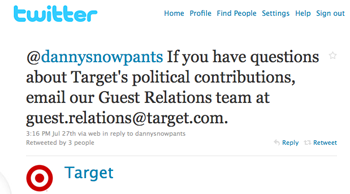 “Companies like Target should stay out of elections, period,” says MoveOn’s petition. But in between, Target made some enlightened social media moves – which makes me wonder who gives them advice, and how often they listen, and how they make decisions..
As anyone who consults to brands via an agency or consultancy can tell you, companies often hire experts to help them navigate emerging media (or anything else for that matter) and then don’t follow the experts’ the advice. That’s not a problem that can be solved any time soon. o	And then there’s good old fear of change? They got outed, of course. 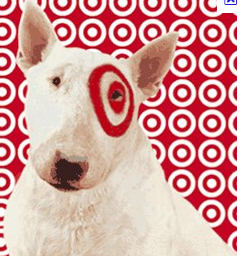 The issue: a blogger complained about a Target advertising campaign that depicted a woman splayed across a big target pattern — the retailer’s emblem — with the bull’s-eye at her crotch. The app allows potential shoppers to virtually try on, and try out Merona fashions- Target’s best selling sweater line. In addition, computer users can also connect to the Target Web site with a “shop it now” feature, which lets them instantly buy the merchandise. c) you need to answer a complaint where it’s made. If it’s made on Twitter, you need to answer on Twitter. If it’s made on YouTube, you need to answer there, etc. Hint” The best way to do better is to just do it.